By September 2020 Rugby will face a shortage of 690 secondary school places if current trends continue - claim Warwickshire County Council. The claim was made in a document submitted to Rugby Council’s Local Plan website. 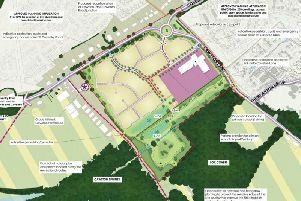 The document also criticises Rugby Borough Council’s plans for Coton Park East – suggesting land should be set aside in case a new school is required to meet the shortfall. Rebecca Flynn, of Lancut Road in Coton Park, said: “It is good news to learn that proposals have now been made for a possible school on the Coton Park Estate. “In light of the current expansion plans in Rugby and current schools having been expanded as far as they can, it would be excellent to see the county council’s recommendation upheld and action taken. "After the problems with the current Year 7 intake I would like to see a pragmatic approach to sixth form provision to make sure the problems they had getting into secondary school are not repeated after GCSEs. “Lots of people from Coton Park send their children to Lutterworth now but that school is full and that avenue will not be available in the future. Gemma Evans, of Snellsdale Road, said: “It would be amazing to have a secondary school so close to home. “I hope it opens in time for my youngest daughter to go there. It would be good for parents’ evenings and emergencies. “My eldest daughter has been given a place at Rugby Free Secondary School because there are no places locally. The council states the secondary school place shortage will decrease as the proposed new school opens at the Houlton site in 2022 and the secondary school in the South West Rugby development opens in 2025. View the document in full at goo.gl/LG5syX.